KARACHI: The stock market extended overnight losses on Thursday as the index fell by another 354.57 points to close at 41,266.39. Cement scrips did most of the damage following the decline in cement sales for August. The cement sector lost 101.34 points as Lucky Cement was down 2.73pc, DG Khan Cement 4.83pc, Fauji Cement 2.62pc and Maple Leaf 3.27pc. Oil and gas marketing sector also closed the session in red, losing 54.34 points, after Sui Northern Gas Pipeline declined 3.57pc, Pakistan State Oil 15.3pc and Attock Petrol­eum 2.49pc. Additional drag came from fertiliser and power generation which cumulatively contributed 88.34 points to the decline. 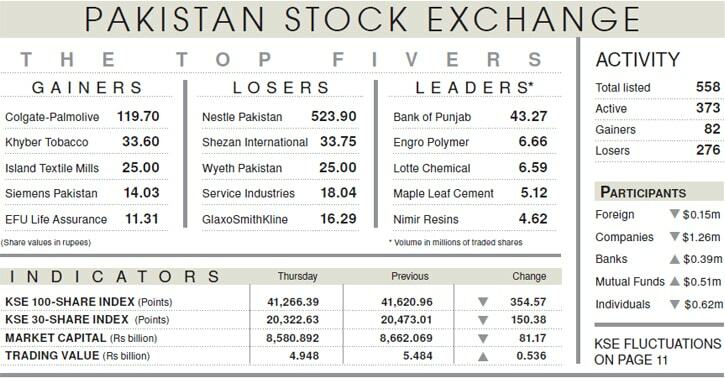 Banking stocks, on the other hand, came in the limelight pushing the index to an intraday high of 41,715 during early hours as analysts saw a 50-100bps increase in policy rate imminent, following a 7.7pc jump in core inflation during August. Gains in banks were led by Habib Bank Ltd, up 1.19pc, United Bank Ltd 1.49pc and Bank of Punjab gaining 2.75pc following heightened activity in the scrip. The volume traded clocked in at 159 million shares, decreasing by 25.7pc from yesterday’s tally. 43.27m shares of Bank of Punjab were traded during the day, contributing 27pc of the total turnover, followed by Engro Polymer at 6.66m, Lotte Chemical 6.5m and Maple Leaf at 5.12m. Foreigners emerged as net sellers in today’s session after offloading $0.15m from the market whereas local investors closed the session in net positive, increasing their overall positions by $0.15m. Amongst local participants, companies and brokers cumulatively sold $3.97m worth of equity with major support resulting from $3.13m buying from insurance companies and mutual funds.